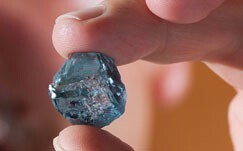 An exceptional 29.6-carat blue diamond has been discovered at the Cullinan mine in South Africa, the mine's owner, Petra Diamonds, announced recently. "The stone is an outstanding vivid blue with extraordinary saturation, tone and clarity, and has the potential to yield a polished stone of great value and importance," the company said in a statement. "Blue diamonds are among the rarest and most highly coveted of all diamonds, and the Cullinan mine is the most important source of blues in the world. This stone is one of the most exceptional stones recovered at Cullinan during Petra's operation of the mine." Located at the foothills of the Magaliesberg mountain range, 37 kilometres north-east of Pretoria, the Cullinan mine earned its place in history in 1905 with the discovery of the Cullinan diamond, the largest rough gem diamond ever found at 3 106 carats. This iconic stone was cut into the two most important diamonds that form part of the Crown Jewels in the Tower of London - the First Star of Africa, which is mounted at the top of the Sovereign's Sceptre and which at 530 carats is the largest flawless cut diamond in the world, and the Second Star of Africa, a 317-carat polished diamond which forms the centrepiece of the Imperial State Crown. According to Petra Diamonds, the Cullinan mine frequently yields diamonds larger than 10 carats, and has produced over 750 stones weighing more than 100 carats, 130 stones weighing more than 200 carats, and around a quarter of all diamonds weighing more than 400 carats. 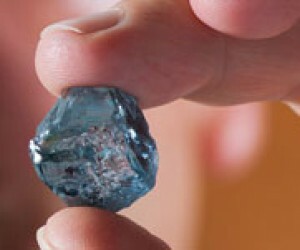 "Cullinan is also renowned as the world's most important source of blue diamonds, providing the collection of 11 rare blues displayed in 2000 at London's Millennium Dome alongside the Millennium Star and which included the fancy vivid blue 'Heart of Eternity' (27 carats polished)," the company said. Petra Diamonds has interests in five producing mines in South Africa and one in Tanzania, and also maintains an exploration programme in Botswana.